I’m still not sold. Here is what I think. I’d love to hear what you think! Accent. The deep tones in this palette are a wonderful accent for walls to lighten spaces such as those above. I also like to use these tones in accent pieces. 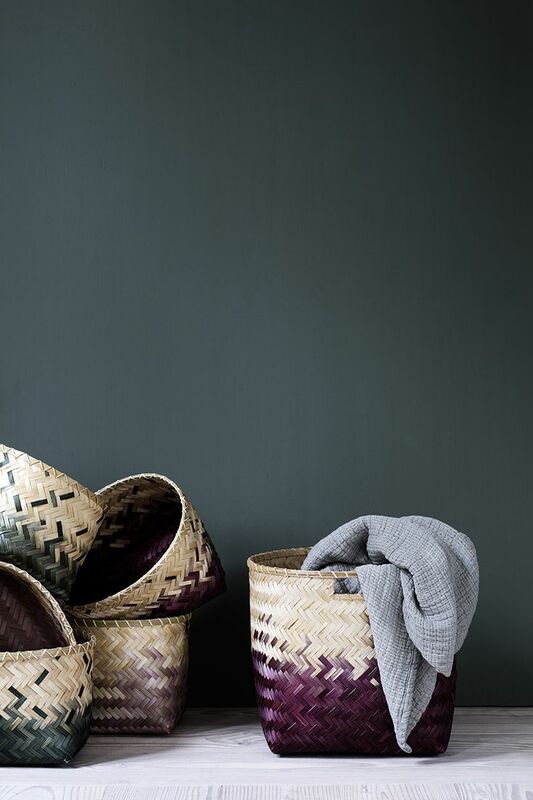 Although this description suggests the “futuristic” flair, I love to mix these tones with natural fibers such as these fantastic baskets. FUN. I’m still in love with golds, rather then silvers. However, I am also a big believer in mixing metals. This palette as so much potential. We all know how much I love FUN spaces! The rug with it’s plumb layers and hints of the entire palette paired with white and yellow take a potentially dreary space to another level. Elegant. Simplicity in grand spaces almost always screams elegance. I do prefer a bit of a darker color to ground the space., specifically in those with high ceilings. This dining space is perfection. 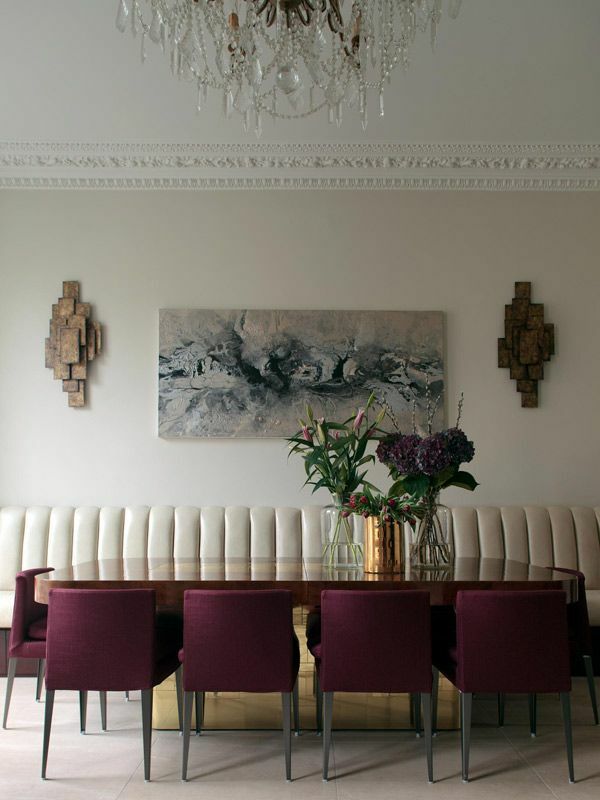 The plum chairs are just the right amount to balance the wall decor and artwork in tone as well as the compliment the delicate moldings, crystal and textured banquet. Regal. When paired with dark, industrial and masculine pieces, you get a regal space. This bedroom is plain in terms of decor. yet, the concrete textured walls and the ornate head is heavy, dark and has a ton of movement. 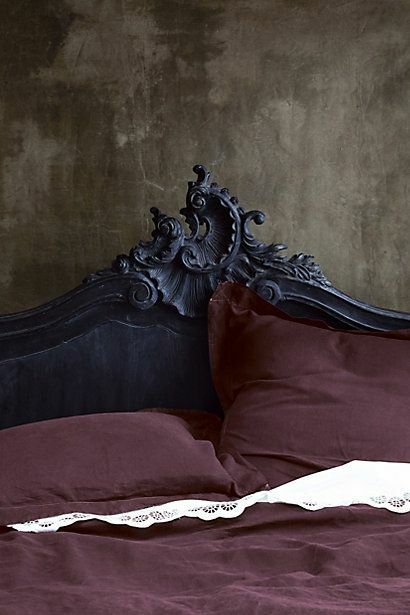 The lace detail on the bedding is a welcome surprise. Bold. No need to shy away. 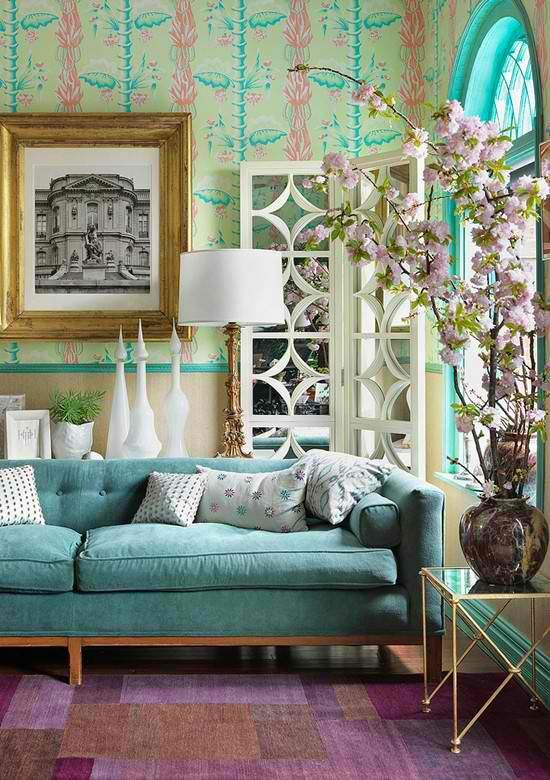 Splash the color on large pieces to define the space. Have no fear. Go Bold! CaPOW. Anyone who has ever worked with me knows that I believe deeply in the emotions that a space induces. I have no words for the space below, just…CaPOW! I am in love with the unexpected drapery hardware, the pop of the sofa and the simplicity, or rather, plainness, of all other elements in this room. I may want to replace the side table with a chuck of tree and the rug with a pattern or shag. This space is one that could fit in most US homes. Give it a try, add your own CaPOW with Trajectory! Accent. Fun. Elegant. Regal. Bold. CaPOW.